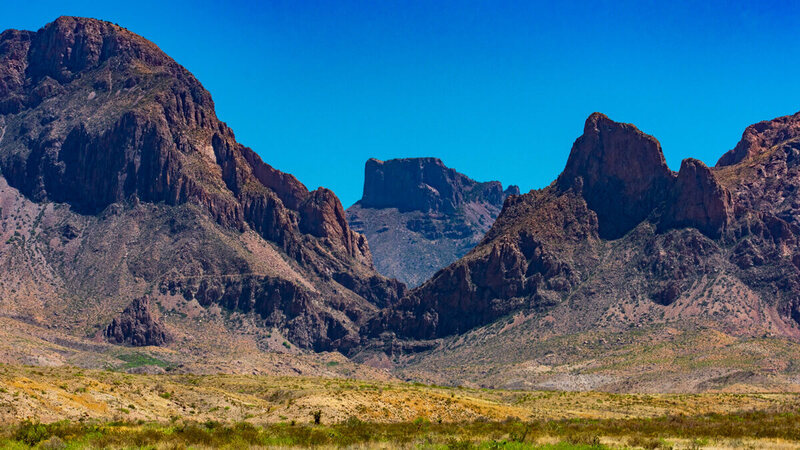 RV Camping | Big Bend National Park - Eat See RV! 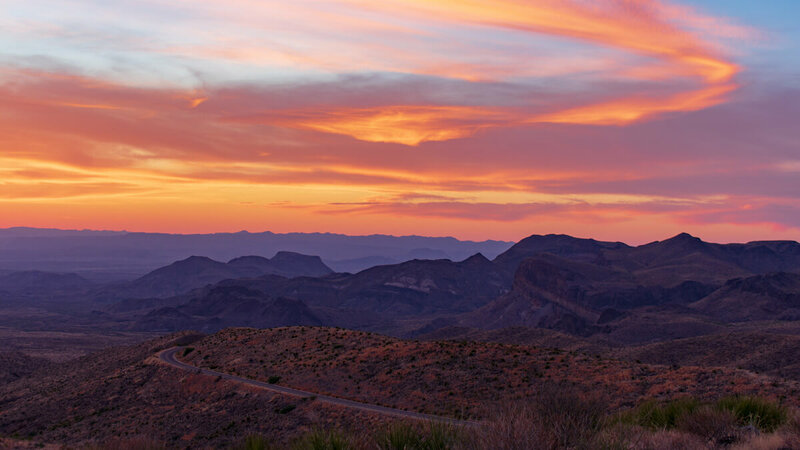 Big Bend National Park is a true gem for the state of Texas. 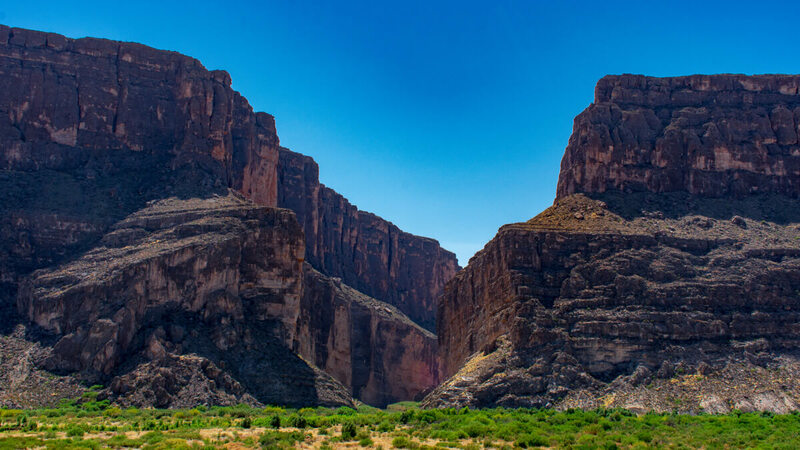 Located in southwest Texas on the border of Mexico and the Rio Grande River it boast over 800,000 acres of gorgeous mountains, rivers, and desert landscape. We camped at Big Bend in our RV in March. In our video we talk about what to know before you go, things to do around the park, best hikes, camping options, and more! 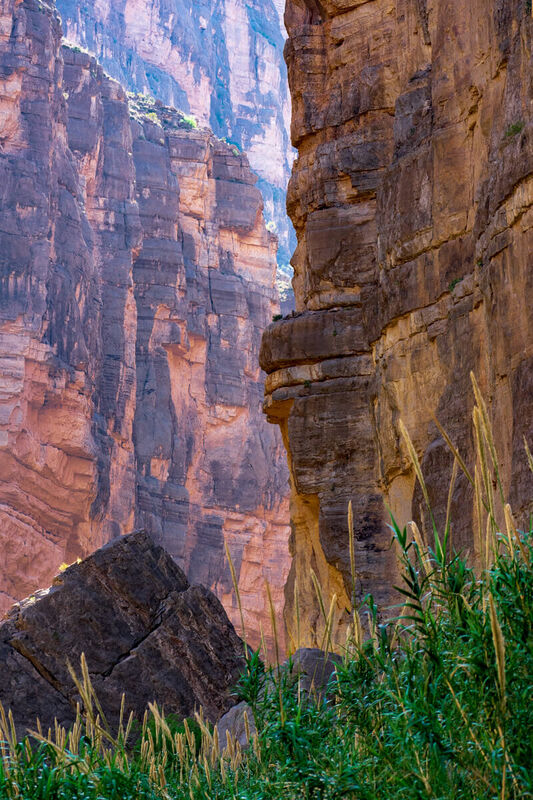 Take a look at this beautiful National Park and all of the wonderful things there are to do! If you’re interested in camping at the park there are three developed campgrounds all of which cost $14 per night (if you do full hookups at Rio Grande Village it will likely cost more). Chisos Basin – right in the heart of the Chisos mountains. It’s a smaller campground that can only accommodate smaller rigs (there is a very windy road to get to it). If you’re over 25 ft it’s unlikely you’ll be able to camp here. If you are a smaller rig this would be your best bet. It’s smack dab in the middle of the park so you can easily get from one end to the other with your “home base” being right in the middle. Cottonwood – the smallest of the three campgrounds on the far west side of the park (near Santa Elena Canyon). It is close to the river so it has some trees for shade but plenty of sun for solar as well. It’s a no generator zone, so if you’re reliant on your generator this won’t be the best fit for you. If you’re into backcountry camping (for both tents or RV’s) you can apply for a 14 day permit although permits are limited (especially for back country RV parking). You must be present to get a permit, you cannot call to reserve the permits.The roads are do-able even for big rigs, but it is a primitive, dusty, rough road with lots of rocks and pot holes so go slow or if you’re nervous camp at one of the developed campgrounds. It’s $14 for the entire 14 days so a super affordable option if the passes are available. 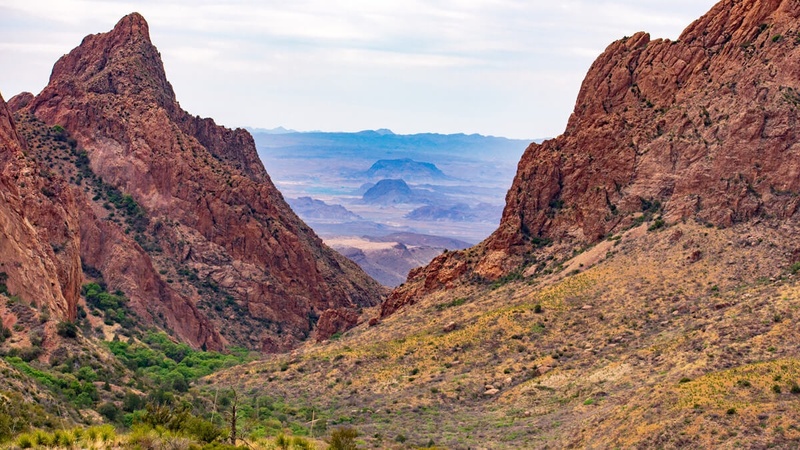 You must go to Visitor’s Center near the Chisos Basin to get backcountry permits (the first Visitor Center near the entrance of the park cannot do permits there). 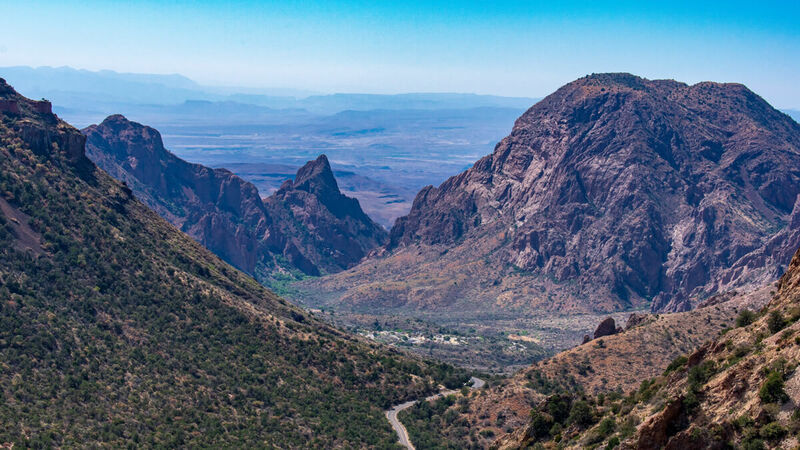 With three distinct regions; the desert, the mountains, and the river there is plenty to do in Big Bend. Southwest Texas is dry and hot. Even though we were there in early spring, the day time heat saw highs 90+ degrees some days. 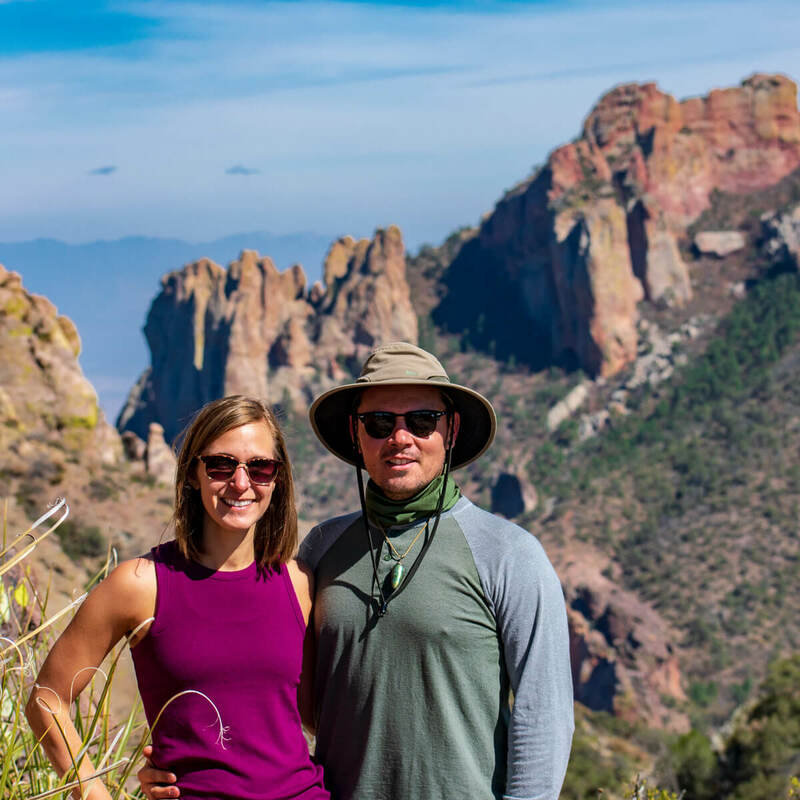 We spent the most time in the Chisos Basin mostly because the high elevation of the area made it about 10 degrees cooler no matter what time of day and many of the trails offer shade as you hike. You can find shade in Santa Elena Canyon area as well, but the desert areas throughout the remainder of the park could be brutal in the heat and sun. No matter where you go in the park bring a TON of water (like more water than you think you can drink). 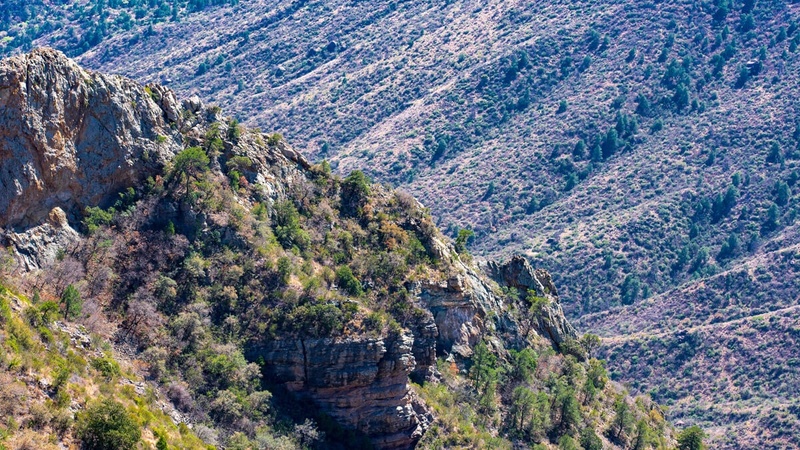 There several hikes in the Chisos Basin area. We completed Lost Mine Trail which is 4.8 miles roundtrip and a very fun, beautiful hike. You “climb” up the mountain to be rewarded with spectacular views of the mountains. We highly suggest this trail. We also completed the Window Trail which brings you to the “window” in the basin. It was a fun hike that was downhill at first (which is a bummer because then when you’re walking back, you have to walk up hill but that’s just me…). At the end of the trail when you get close to the window view you get to climb up some really cool rocks and makeshift rock stairs. This is another easier hike that has a high reward for the effort put into it! 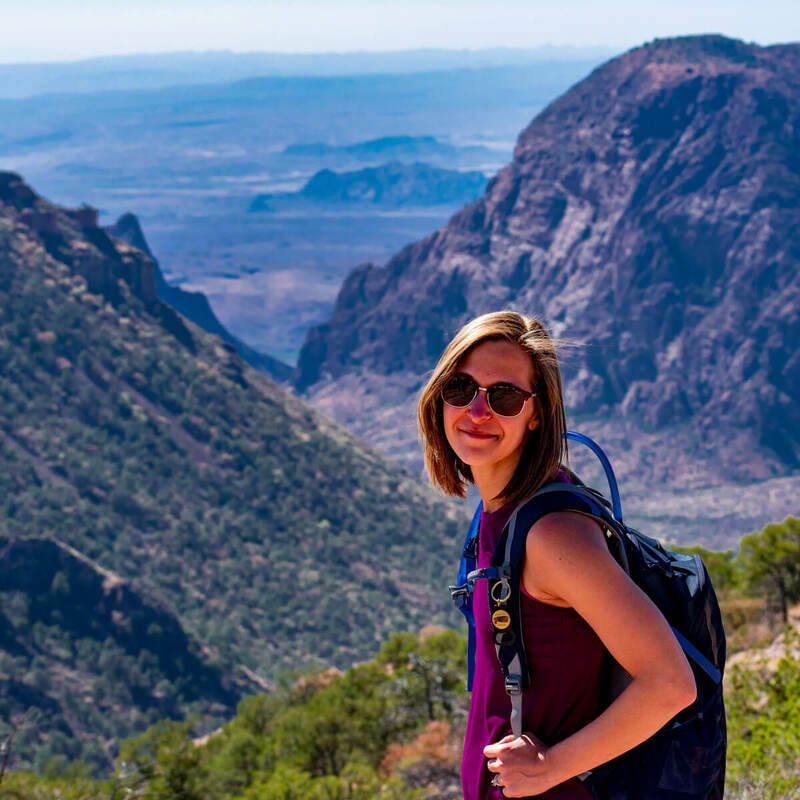 Probably the most hiked trail that is pretty well known in Big Bend is the South Rim. As we mentioned in the video, completing this hike is probably best if you camp overnight (which would require a back country permit) so planning would need to be involved. At 12 miles, with lots of overlooks and wonderful stops along the way, one day would be rushing it not to mention it would be a super long day. Some people do part of the loop and climb up to Emory Peak, but we were told by several people the effort, difficulty, and length of the hike just isn’t worth the reward (we heard the view is just okay and it’s mainly rocky canyon with very little views along the way). So if you can’t do the entire South Rim this go around, enjoy some of the other trails that still offer great views without all that work! Give yourself ample time to explore each of the areas of the park, I would dedicate at least one day to each part of the park if possible. As you can see from the pictures the landscape is just breathtaking! 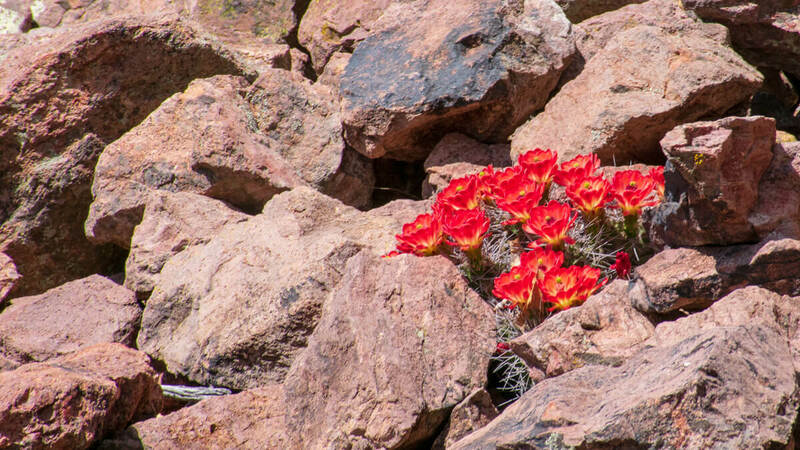 If you are on the west side of the park near the Canyon, try one of the desert hikes Mule’s Ears. 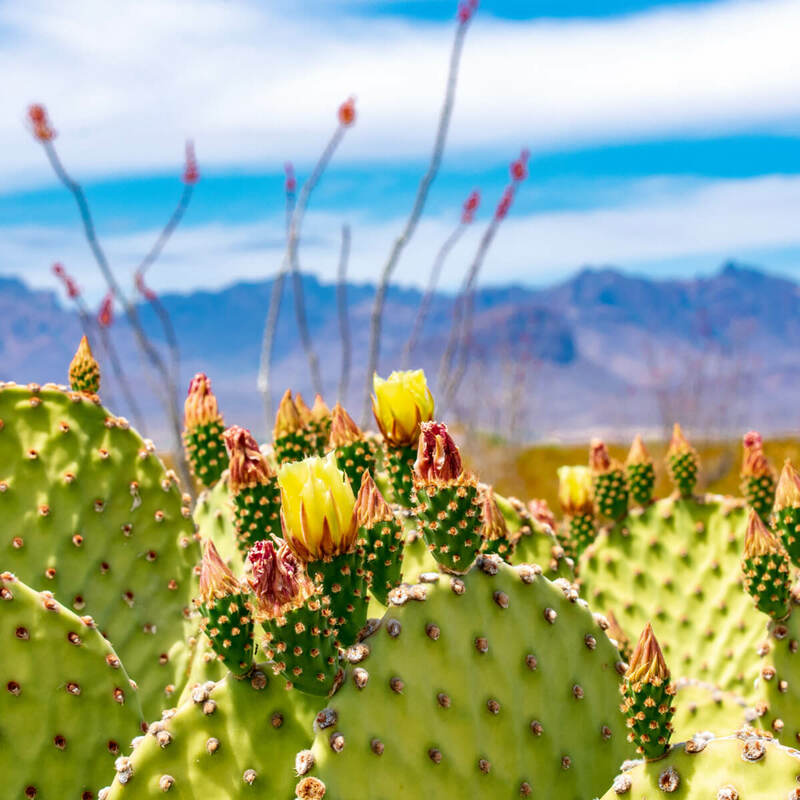 As you saw in the video we chose not to do this hike because of the heat and sun that day, but we heard from several people that it’s a really nice hike that does a good job exposing you to the landscape and habitat of the Chihuahuan desert. We suggest doing this hike early in the day when it’s cooler and you face less sun exposure. There is absolutely no shade on this hike and is a relatively flat easy trail that is just under 4 miles. Another desert hike that was highly recommended but a bit longer is Chimneys Trail a 4.8 mile trail that is on the east side of the park. 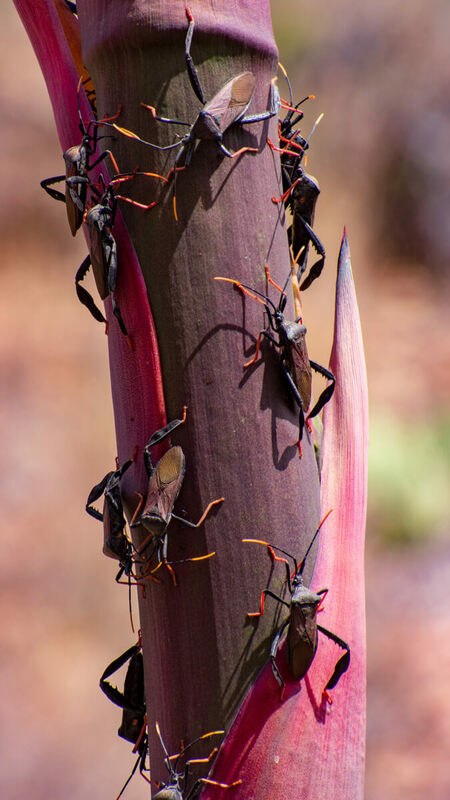 While it may show you much of the same desert habitat and wildlife it has different mountain views and vistas so it becomes it’s own new experience. Again, very little to no shade so either hike early or be super prepared with protective cover (like hats, buffs, long sleeves and/or sunscreen), and lots and lots of water! 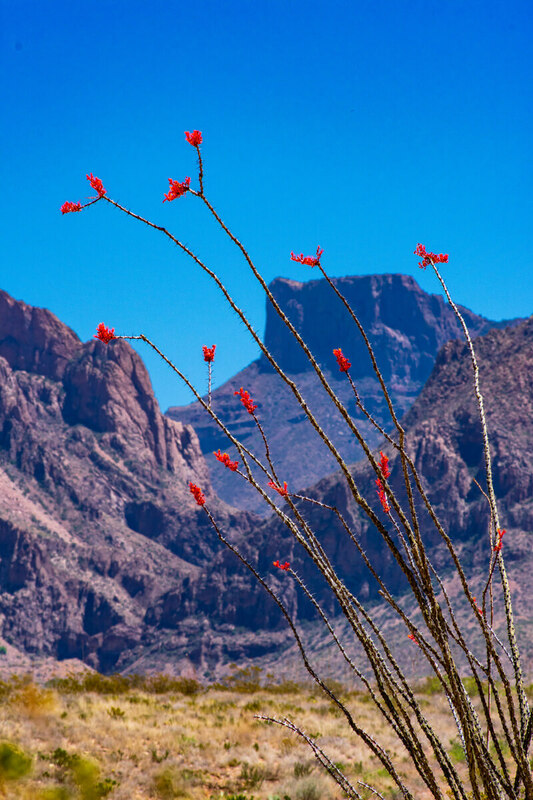 If you’re looking for more hiking options you can visit the National Park Service’s Trail Guide for Big Bend. It tells you the difficulty level, length, and area of the park it’s located in. Santa Elena Canyon was Liz’s favorite experience of the park. 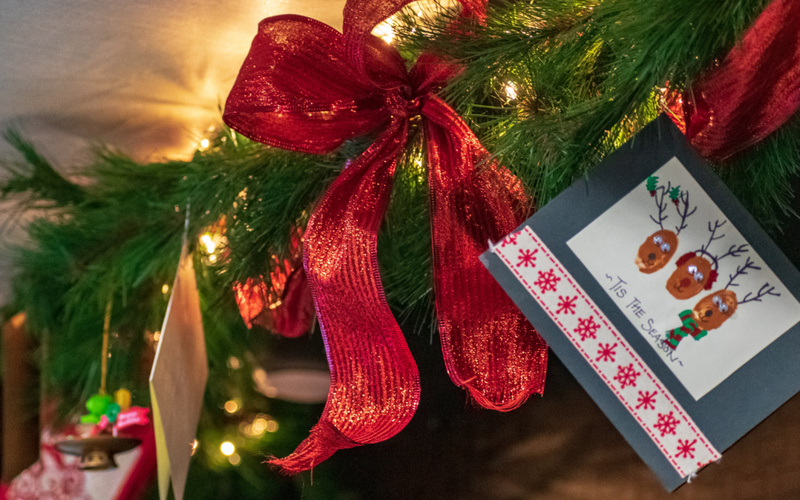 Having never really been “out west” (with the exception of California), it was the first place that made her feel like she was in new, unexplored, and grand territory. 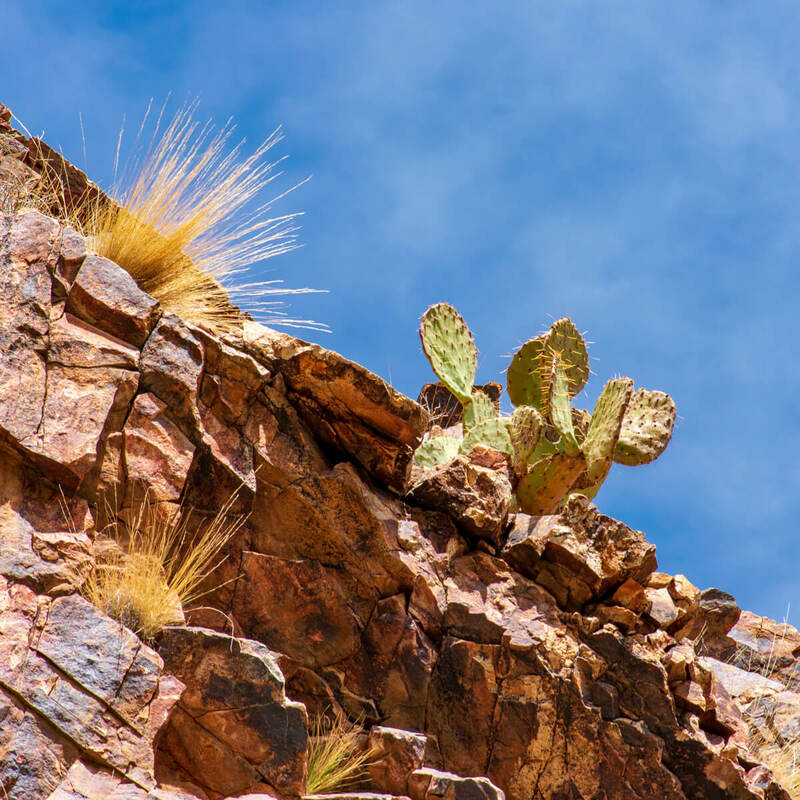 The canyon walls towered over the Rio Grande while the rocky mountainside was covered in blossoming prickly pears and the birds flew overhead. It is a sight to behold and I hope everyone is lucky enough to witness it’s beauty. 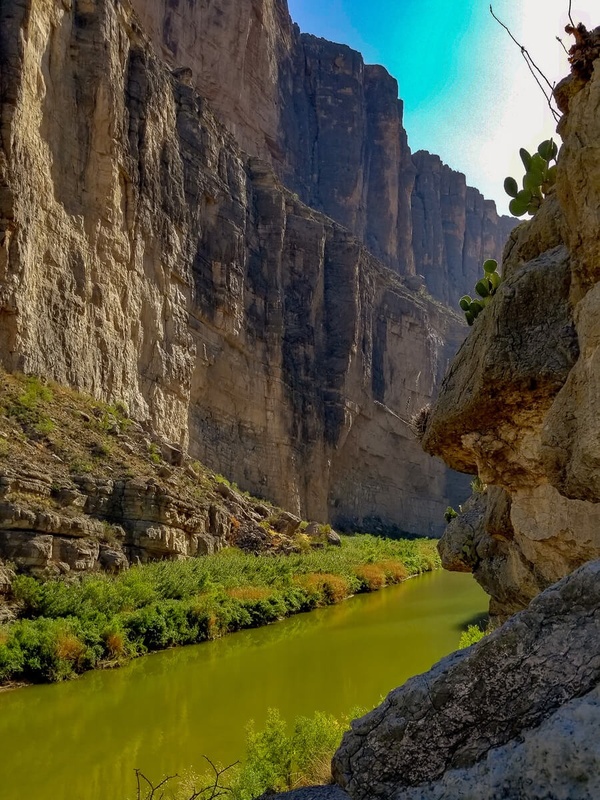 The hike into the Santa Elena Canyon is a relatively easy one (just about a mile and a half) that goes up the side of the mountain (with a walking area/steps) and down into the riverside. The landscape changes dramatically as you hike. 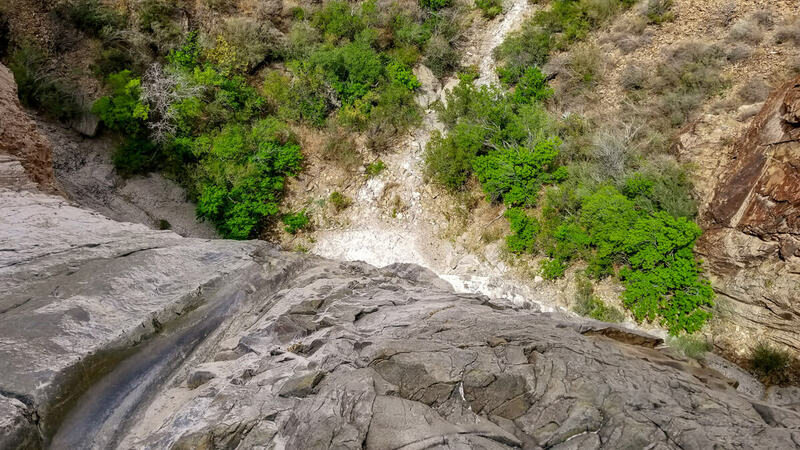 We saw several people take a moment of our the hike to enjoy in the views and peacefulness of the river on one of the rocks the juts into the Rio Grande. This would be the perfect spot to have a rest or picnic. We took our bike everywhere throughout the park. 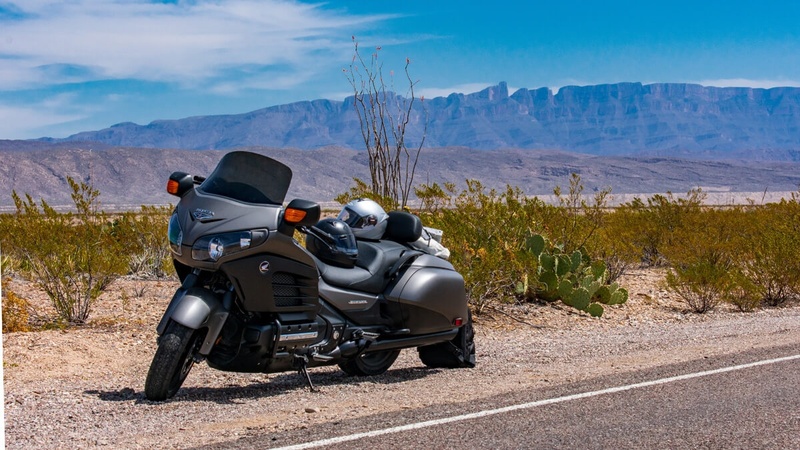 Not only was it better on gas, but it allowed us to take in Big Bend in a whole new way. If you’ve never ridden a motorcycle it’s hard to describe what an experience it can be. You see more, feel more, and connect more to all that’s around you. As we rode the motorcycle back to our campground after leaving Santa Elena Canyon we followed the sunset up to Sortol Vista overlook. The sky was illuminated with gorgeous purple, pink, red, and orange over the mountains and desert down below. It was perfect. One of our favorite parts about Big Bend was the natural hot spring that sits on top of the Rio Grande. It’s an intense drive down there (in a dually at least). There is a sign that says no dually, tag axles, or RV’s down this road and honestly we should have listened. It was a scary ride in and out down a dry, dusty, and very rocky cliffside. Once you get to the parking area, it’s a quick, nice walk up to springs. 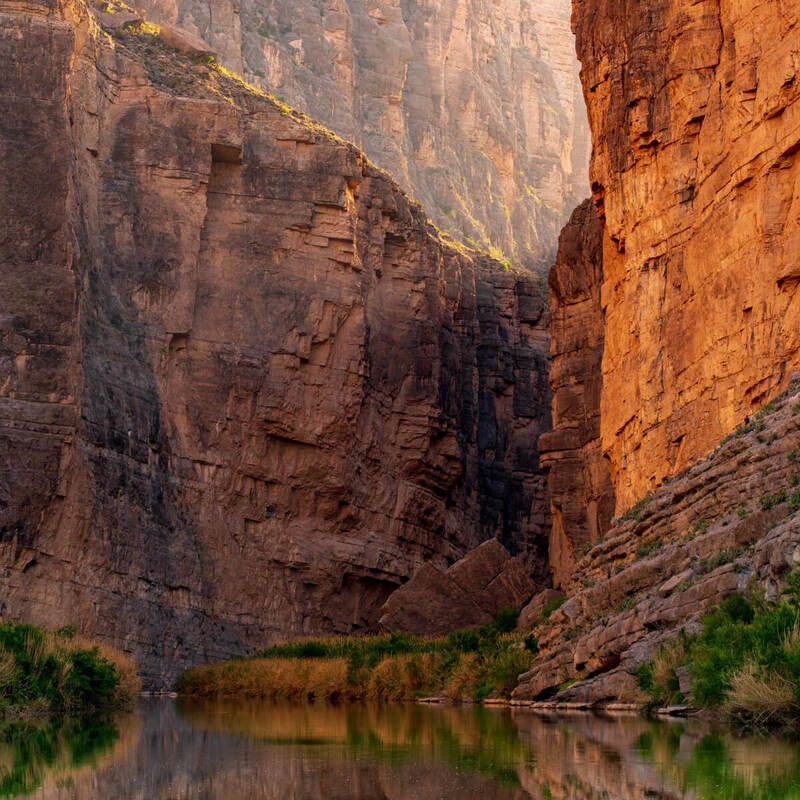 This is a very desirable destination for the visitors of Big Bend it’s extremely unlikely you’ll be by yourself. 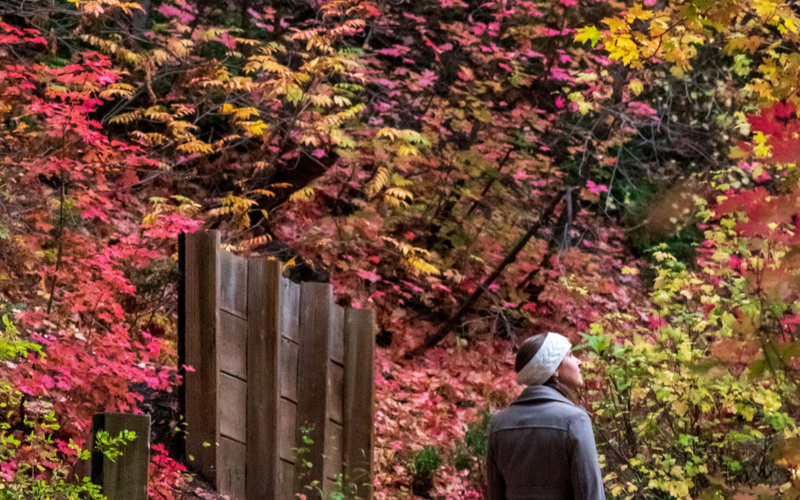 The best times to go if you’re looking for solitude and relaxation is dawn and after dark (there still is a chance other people will be there). Sunset is a very popular time here as you can see from the video but we loved getting there just before the stars came out and watching them light up the sky. 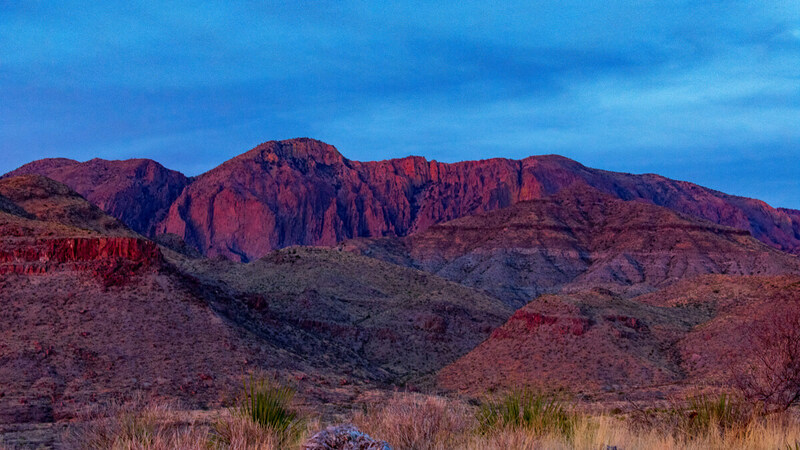 Big Bend is one the certified International Dark Sky Parks so it’s start gazing is on point! If it’s been raining a lot the spring may be flooded so be prepared for a muddy experience. In March during our visit, it was nice and full where it actually overflowed into the river. 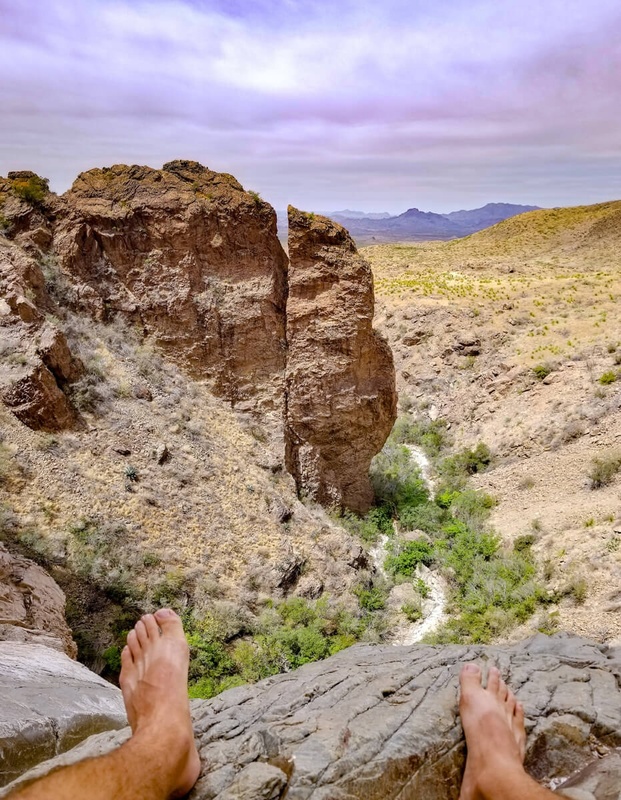 If you got too hot in the spring, you could climb into the Rio Grande and sit under the cascading warm water which kept you at the perfect temperature. Keep an eye out for donkeys that often pass by on the Mexican side just across the river. Big Bend was magnificent. We cannot wait to go back and explore the areas of the park we didn’t quiet get to this time. 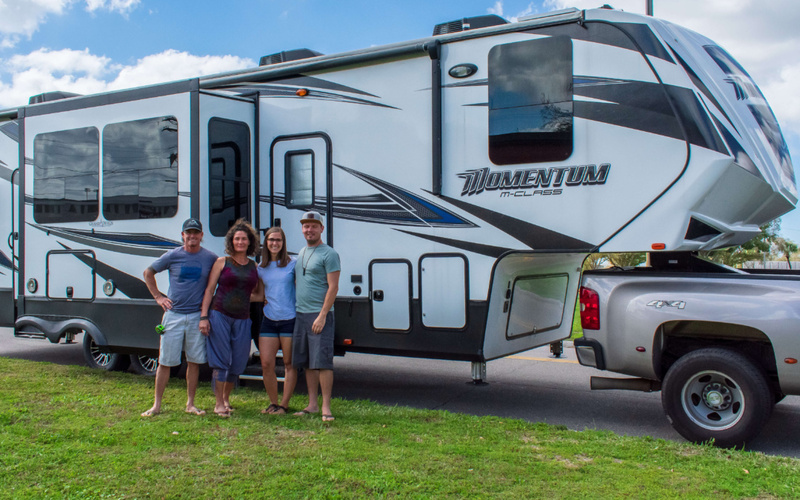 It’s definitely a place you come to time and time again and I hope this post and video helps you if you plan on RV’ing or Visiting Big Bend National Park! 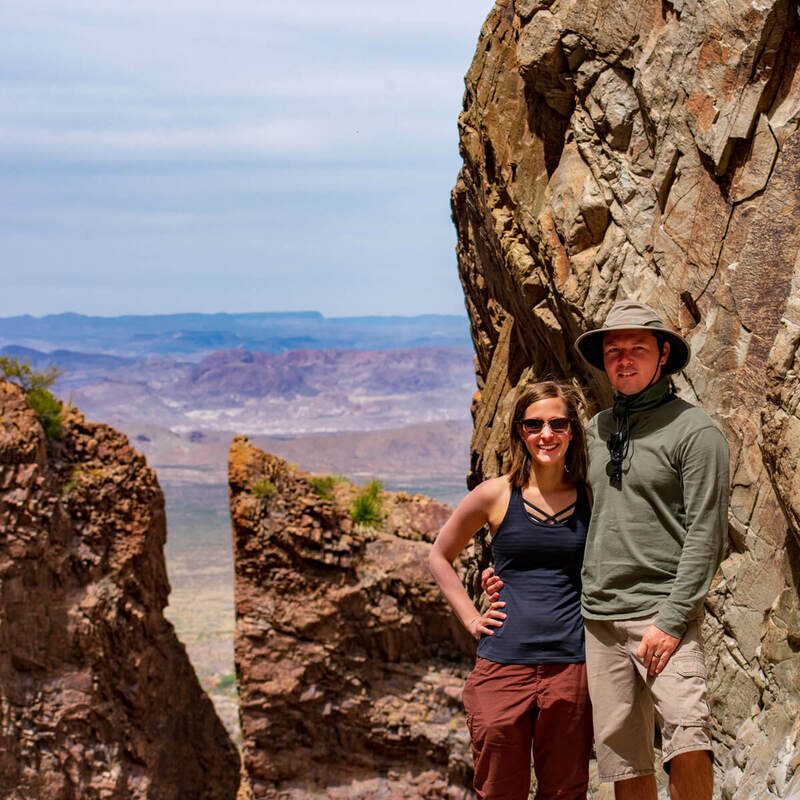 This blog and video was sooooooo helpful planning our big bend trip in our 351m next month! Ty! Oh yay! So glad you found it helpful. Enjoy your trip! !